Received such amazing customer service from Kat at storage king Rolleston during a stressful move from Auckland! Would highly recommend! Thanks for the great review, M.. It was a pleasure serving you as a customer. Half Day Truck Hire $78.90 Fantastic value, great service, amazingly friendly staff, easy to drive truck. Sorry we couldn't stop for a coffee. What an amazing team you have here in our community sponsors for Rolleston Rugby club and drink bottles for Netball. Will recommend to everyone. We specialise in all your Storage Solutions including; Packing Materials, Boxes, Moving, Commercial and Residential storage, packing, cleaning and more! We also have a two “Free move in trucks” for our customers to use! 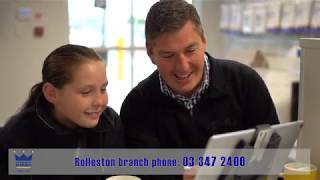 We are The Kings of Storage, Moving and More and are happy to be serving the Rolleston Community! Storage King Rolleston proudly services Christchurch, Burnham, Springston, West Melton, Lincoln and Prebbleton.